London’s first festival of cabaret has been launched at new venue The Oak Room at The Hospital Club, with a small but tantalising selection of songs from a few of the artists to feature over the festival period from Tuesday, 22nd October-Friday, 15th November. For lovers of cabaret, or those who simply enjoy a good show, or even for the mildly curious – this festival is an absolute must. 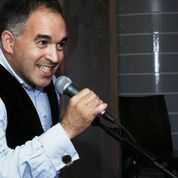 Neil Marcus, Artistic Director of the London Festival of Cabaret, acted as MC introducing the artists. The first artistic director of the Jermyn Street Theatre, former programmer of the Matcham Room at The Hippodrôme, and Associate Producer of The Great British Songbook at the Shaw Theatre, Marcus has long had a passion for cabaret. The festival is his brainchild and already plans are underfoot for next year’s programme. Husband and wife team Leigh Zimmerman and Domenick Allen gave us a taste of what promises to be an interesting combo at St James Studio contrasting rock and musical theatre material, with a through-line on relationships. 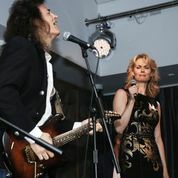 This is the first time these very different artists – Zimmerman elegant and sophisticated, and Allen the quintessential guitar-wielding long-haired rock star -have produced a cabaret together. Expect a bit of frisson. 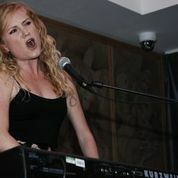 There will also be an evening of Emerging Cabaret Stars and Writers at The Crazy Coqs which will include Tamar Broadbent, who sang two of her own comedic compositions. This young artist displayed a multitude of talents from musical theatre skills, comedy and composition to piano. The material she presented afforded us a glimpse of an insight beyond her years – definitely one to watch. Also present at the launch were The Three Shonas – Shona White, Shona Lindsay and Shonagh Daly – one Irish and two Scottish leading West End ladies, who will present an evening at The Pheasantry specially put together for the festival. Drawing on their shared musical theatre backgrounds, they will celebrate their Celtic roots singing in close part harmony and, as Daly says,”.. explore the meeting and crossing of our different roads”. These acts are but a small sample of the huge array on offer, the itinerary of which is displayed below. As well as homegrown talent, such as Rachel Tucker, Claire Teale and Liz Robertson, U.S. artists, some of whom we know well including Steve Ross, KT Sullivan and Selena Jones will be launching new shows, and the legendary Michael Feinstein will be at the Palace Theatre. There will be lectures on the history and future direction of the artform and a Masterclass from Maria Friedman, as well as the aforementioned from Barb Jungr. I will be covering as many of these events as humanly possible, and I’d love to hear from you readers as well. What will you be seeing? Tell me what you thought of them – don’t be afraid to use the comment box. What is happening in the London cabaret scene is nothing short of extraordinary. Venues for the genre are sprouting everywhere, and the range and variety of styles under the vast umbrella term of ‘Cabaret’ ever growing. Discussions on what cabaret is, or should be, is heated and passionate, and positions fiercely defended. More on this later. Be part of this conversation yourselves. Where do you stand? 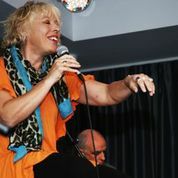 This entry was posted in Features - Theatre and Cabaret News, Uncategorized and tagged Barb Jungr, Claire Teale and Liz Robertson, fiona jane weston, KT Sullivan and Selena Jones, Leigh Zimmerman and Domenick Allen, London cabaret, London Festival of Cabaret, maria Friedman, Michael Feinstein, Neil Marcus, Palace Theatre., Rachel Tucker, Shona Lindsay and Shonagh Daly, Shona White, Soho Theatre, St james Studio, Steve Ross, Tamar Broadbent, The Crazy coqs, The Oak Room, The Pheasantry, The Three Shonas. Bookmark the permalink.